The Movember Foundation was founded in 2003 and tackles some of the biggest health issues facing men, including prostate cancer, testicular cancer, mental health and suicide prevention. 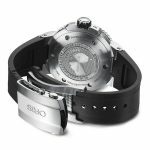 Its mission is to help men live happier, healthier, longer lives and to stop them dying too young. Every November, it encourages men to grow moustaches to raise money in support of the 1,200 health projects it runs around the world. 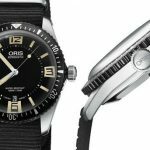 The event enjoys worldwide backing and is supported by numerous celebrities in sport, comedy and fashion.Celebrating this new partnership, Oris introduces a special “Movember” edition of its now famous Divers Sixty-Five, a heritage piece inspired by an Oris diver’s watch first introduced in 1965. 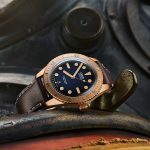 This watch started its life back in 2015, in 40mm edition, later followed by several variations and case updates: Deauville blue, 42mm bronze “Carl Brashear” Limited Edition, 42mm standard version, Green dials and finally a silver version. 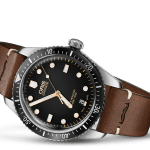 The Divers Sixty-Five now is a proper member of the collection. 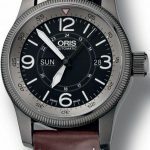 This sought-after watch now becomes the basis for Oris to create the “Movember” edition, with several interesting visual updates.The Oris Divers Sixty-Five Movember Edition is based on the 40mm version of the “65” with a stainless case, its usual oversized crown and the 60-minute diving bezel with aluminium insert. 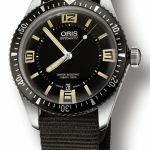 Yet, several changes for this edition are to be noted. 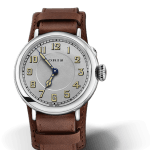 Firstly, the dial has a different layout, inspired by the one found on the 42mm version of this watch – applied dots and batons, instead of a painted dial with a quite retro look. 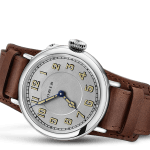 On the other hand, the date remains placed at 6 and not at 3, as on the 42mm edition. 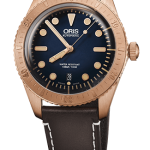 Both the indexes and inscriptions on this Divers Sixty-Five Movember are pink-gold plated, tying the watch in with Movember’s colour palette, and simultaneously creating a unique look within the Divers Sixty-Five collection – with an end result that feels very 1960s, a sort of gilt dial if you want (vintage collectors know…) The hands are also done in the same gold colour.This Oris Divers Sixty-Five Movember Edition has more to show as well, such as a vintage-inspired leather strap with the Movember logo heat-stamped. 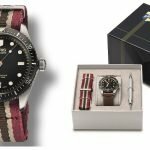 An additional tricolour Bordeaux red, beige and dark brown NATO strap that features the Movember logo on the metal loop. 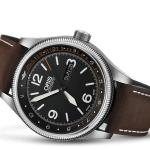 This special edition is delivered in a heritage box, which also comprises a strap-changing tool.On the other side, a 1960s Oris logo is engraved on the steel caseback and is framed by the words ‘Oris Movember Edition’ and the Movember Moustache logo. 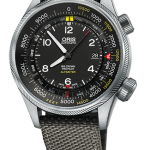 Inside the case is an automatic movement, based on a Sellita SW 200-1, displaying time via 3 hands and the date.During the month of Movember, Oris will host a series of fundraising events across European cities, including shave-downs, poetry slams, Movember walks and an auction of an Oris Movember Edition. 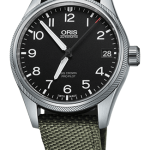 Details will follow via Oris’s social media channels and via the hashtags #ORISMOVEMBER and #ORISCHANGEFORTHEBETTER. 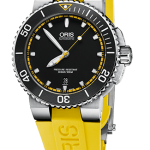 Oris will make a donation to the foundation based on sales of the watch. 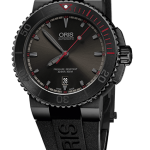 The Oris Divers Sixty-Five Movember Edition is a special but not limited edition, which will be priced at EUR 1,950 / CHF 2,100. 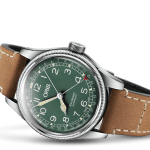 And if you don’t really like the moustache logo on the strap, just change it and you’ll end up with what certainly is the coolest version of the Divers Sixty-Five, with the smaller case and a great vintage design. And you’ll help a good cause too… More details on www.oris.ch and movember.com. 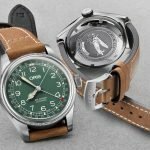 Oris and Australia’s iconic aeromedical service join forces for the second time to create a limited edition version of the Oris Big Crown. It features a pulsometer for measuring a patient’s heart rate. 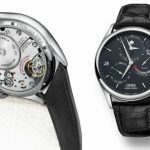 A Modern TraditionOris has been reclaiming its watchmaking heritage with the launch of Calibres 110 and 111, two innovative references that offer watch buyers a unique combination of complications – at a reasonable price. 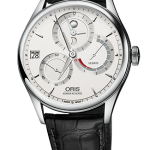 With the Calibre 112Oris offers a GMT function with day-night indication. 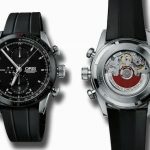 What lies beneathThis skeletonised watch brings elements of both classical and contemporary watchmaking together, combining a skeletonised movement with the best of 21st century watch design and finishing techniques. 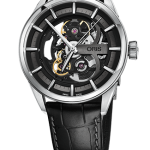 Oris has black-plated the skeletonised parts of the movement in various shades of black and grey, giving it an intriguing three-dimensional finish. 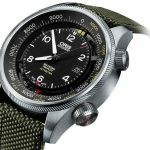 Air TimeMore than 75 years after Oris made its first pilot’s watch, the company is proud to announce the launch of the most innovative pilot’s watch in its history – the Oris Big Crown ProPilot Altimeter, the world’s first automatic mechanical watch with a mechanical Altimeter. 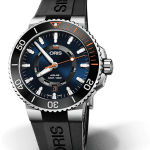 Overcoming great barriersOris has joined forces with the Australian Marine Conservation Society (AMCS) to help protect and preserve the Great Barrier Reef, the world’s largest reef system. 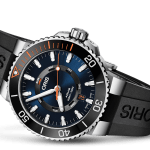 Oris will make a donation to the charity’s vital work, funded by sales of the limited edition diver’s watch called the Oris Great Barrier Reef Limited Edition II. 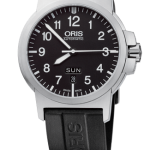 Available with rubber strap or stainless steel bracelet. 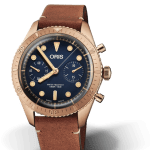 Oris is extremely honoured to introduce its first bronze watch remembering the extraordinary life of Carl Brashear, the U.S. Navy’s first African American master diver.The Oris Carl Brashear Limited Edition is based on Oris’s hugely successful Divers Sixty-Five and celebrates a man who conquered not only challenges of race, but also of disability. Brashear joined the Navy in 1948 as a 17-year-old, and despite facing discrimination on account of his race he graduated from the Navy’s diving programme in 1954. In 1966, he lost the lower part of his left leg in an accident during a mission to salvage a hydrogen bomb. 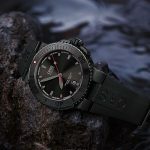 After an exhausting period of rehabilitation, he became the U.S. Navy’s first amputee diver in 1968, and then qualified as a Master Diver in 1970, the first African American to do so.After a distinguished career in the U.S. Navy that lasted more than 30 years, Brashear retired in 1979. He died in 2006 aged 75. 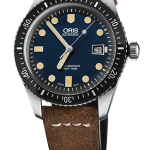 His extraordinary story was the inspiration for the 2000 film Men of Honour, in which Brashear was portrayed by Oscar-winning actor Cuba Gooding Jr.The watch marking Brashear’s life and character is the first Oris watch to be made in bronze, a naturally aging material used in deep-sea diving helmets of the 1950s. 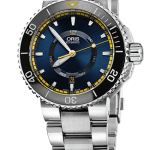 It takes its aesthetic from the Oris Divers Sixty-Five, but at 42mm in diameter. Bronze is initially bright and shiny, and then darkens as its copper content reacts with carbon dioxide and moisture. 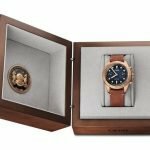 This means each of the limited run of 2,000 pieces will develop a unique patina over time – and a unique relationship with their owner.The Oris Carl Brashear Limited Edition presents a unique opportunity to own Oris’s first bronze watch, but more importantly to pay tribute to a man whose convictions changed the course of history and to support the Carl Brashear Foundation. A man of honour. 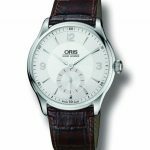 Oris Big Crown Timer. 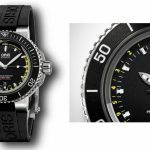 La maison Swiss Oris, known for its sports watches and not dallindiscutibile elegance and precision celebrates its 110 years! 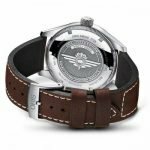 One of its major topics in the field of watches on the theme of aviation is undoubtedly the Big Crown. 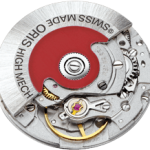 This version is enriched with a burnished brown surface obtained by the technique of automatic Sellita PVD.Movimento Swiss, 44mm case, sapphire crystal, red rotor visible on the back, hands and indices luminova.